Five award winning stone cottages on our non-working farm, in a glorious location over looking dales and rolling countryside in the heart of the White Peak area of the Peak District. Three sleep four persons, one sleeps three (all on the ground floor and therefore particularly suited for the less agile) the other is a spacious cottage (indeed as large as the four person cottages) sleeping two persons and boasts a galleried bedroom overlooking a large living room which has a log-burner on a stone plinth in its centre as a focal point, and a five piece suite in the classy bathroom. Although consistently graded 4 Star, all cottages recently had new kitchens fitted with gloss work-tops, halogen cookers and gorgeous granite stone sinks. The bathroom has also been up-graded. The 3 person cottage is a brand new conversion. The cottages have exposed beams and stone-work. 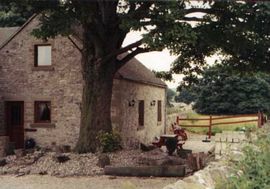 They are 300 yards up our private drive and form part of a courtyard facing outwards over the surrounding fields and dales to give excellent views and some degree of privacy. In front of the cottages is a large grassed and garden area. There is ample area for off-road parking. There are two wild flower meadows on our land, one of which borders a nature reserve leading after just over a mile to the River Dove (at Wolfscote Dale). One mile downstream is Dovedale. 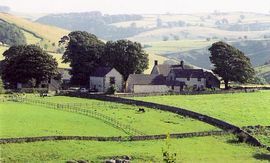 The cottages are located off a quiet country lane between the highly popular village of Hartington and its smaller, quieter neighbour, Biggin. The nearest pub is 700 yards away. Numerous footpaths surround the land on which the cottages stand, offering unrivalled walking in the best part of the White Peak. There are three cycle trails within 3 miles of about 15 miles each. The Peak District market towns of Buxton , Matlock, Bakewell, Ashbourne and Leek and are all about 11 miles away at different points on the compass. Country location but only 350 yards to village and pub. 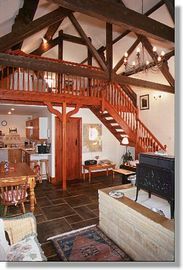 beams abound in all cottages! One cottage is all on the ground floor with no steps inside nor from the car-parking to the cottage. The wet-room in this cottage has a walk-in shower (but can not wheel a wheel-chair in) and a raised toilet. 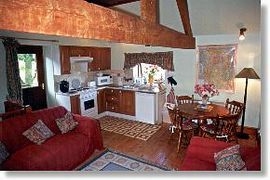 The cottages are just one mile off the main A515 linking Ashbourne and Buxton (half-way between these two towns. The owners send detailed directions to guests prior to arrival. Rentals vary from £240.00 to £500.00 depnding more on season than size of cottage and there are discounts of £20.00 for three person occupancy of the four person cottages and £40.00 for two person occupancy. 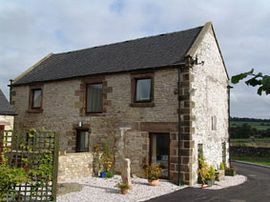 Likewise £20.00 off for two person occupancy of the 3 person cottage and for one person occupancy of the two person cottage. Cottages of the Year by the Highly Commended Cottages Group.